A group of images from the weekend. In between the participation of Slovak Easter traditions, I was able to get a few drawings done. The first two drawings, "Sweet & Coffee" and "Arcadia", were drawn in cafes located in the town of Nové Mesto nad Váhom, north of Bratislava. The city center of Nové Mesto nad Váhom, had some great spots to offer coffee and beer. Sweet & Coffee is located in one of n. Váhom's parks, and has beautiful contemporary glass / wood architectural design. Arcadia is a place I found, while walking down one of the centre's alleys. The drawings are becoming more like completed works, here. After a small line sketch, I am laying down cool values on a separate layers, then the warm values. After that, local colors ( the color of skin, shirt, etc... ) are added. After that a third or fourth layer is added to add darks and lights in certain spots, to direct the eye to certain spots of the composition. 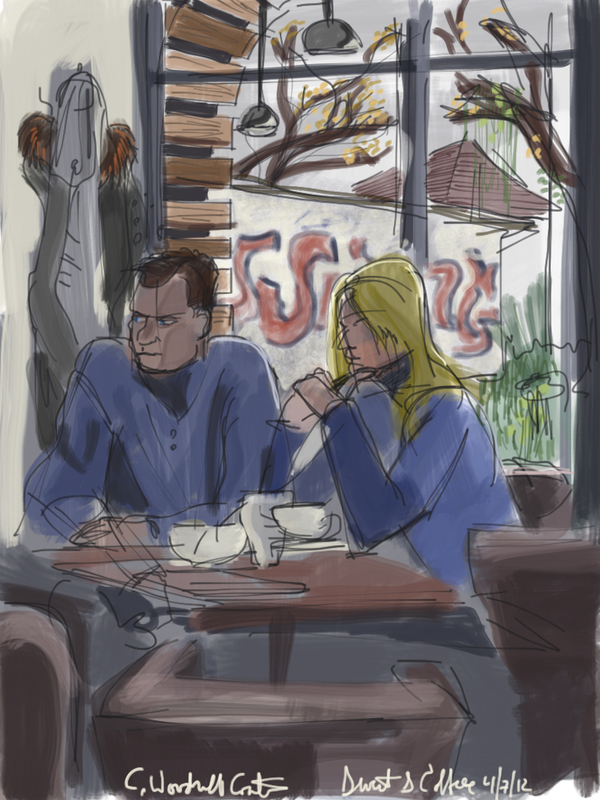 The last drawing was done a week ago, today, at KC Dunaj, one of my favorite spots here in Bratislava for a drink. I haven't posted it yet, so now seemed like good time to include it. Enjoy!